Pesticide « Global Market Insights, Inc. Taking into consideration the geographical trends, Asia Pacific dimethyl carbonate industry, which dominated the regional landscape in 2015, is forecast to experience a considerable expansion over the years to come. Rising consumer preference for high quality paints with the increase in per capita income will drive the regional development. Indonesia, China, and India are expected to be the key regional revenue pockets. 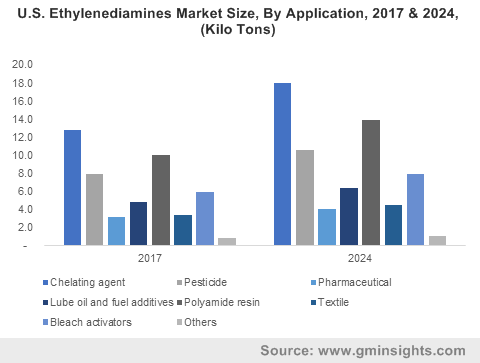 North America dimethyl carbonate market size, which was estimated at more than USD 90 million in 2015, is projected to expand remarkably over the coming seven years. Favorable government policies to improve the public infrastructure along with scaling up of the construction activities is anticipated to support the business expansion. U.S. dimethyl carbonate industry is likely to be a major revenue driver. Dimethyl carbonate industry size in polycarbonate sector, which was evaluated at more than USD 200 million in 2015, is expected to experience a striking growth over the next few years. Escalating applications of polycarbonates across the medical, automotive, lightning & appliances, glazing, and electronics sectors are expected to boost dimethyl carbonate industry growth. Polycarbonate sector, which produced a revenue of more than USD 14 billion in 2015, is slated to hit USD 22 billion by 2024, which in turn, will help the market players to expand their profits through heavy business investments. 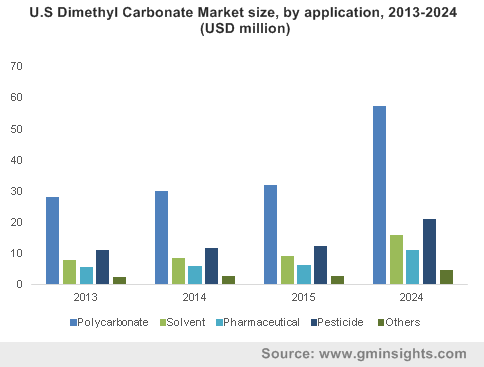 Dimethyl carbonate market share in the solvent sector is anticipated to grow at a CAGR of more than 6% over the coming seven years. The ability to provide exceptional solubility, odor, and low rate of evaporation is expected to make the product more useful in coating resins, concrete coatings, auto refinish, steel drum linings, architectural coatings, floor coatings, and traffic paints. Eco-friendly nature of the product along with its low costs are projected to enhance its demand in the production of solvents and automotive fuels, thereby catalyzing the growth of dimethyl carbonate industry. Potential application of dimethyl carbonate as a gasoline additive across the energy sector will further enlarge the scope of the business. Market players are adopting key business growth strategies such as new product development and high R&D funding to increase their ROI. AkzoNobel N.V., HaiKe Chemical Group Limited, EMD Millipore Corporation, Sigma-Aldrich Corporation, All-Chemie Limited, Alfa Aesar, Shandong Shida Shenghua Chemical Group Company Limited, UBE Industries Limited, Dongying City Longxing Chemical Company Limited, and Tangshan Chaoyang Chemical Company Limited are the key participants of dimethyl carbonate industry. This entry was posted in Bulk & Specialty Chemicals and tagged Dimethyl Carbonate, Dimethyl Carbonate Market, Dimethyl Carbonate Market Analysis, Dimethyl Carbonate Market Forecast, Dimethyl Carbonate Market Future, Dimethyl Carbonate Market Growth, Dimethyl Carbonate Market Outlook, Dimethyl Carbonate Market PDF, Dimethyl Carbonate Market Price, Dimethyl Carbonate Market Report, Dimethyl Carbonate Market Share, Dimethyl Carbonate Market Size, Dimethyl Carbonate Market Trends, Dimethyl Carbonate Market Update, paint and coatings., Pesticide, Pharmaceutical, Polycarbonate, Solvent.